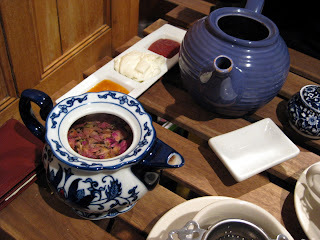 I have been going to Cha-An for tea too many times. So my friends Charles, Iris, Damien and I went to Podunk instead. There are quite a few tea places in NYC to choose from (yelp search). This is not a high society ladies' luncheon type of gathering (do I EVER have that anyway??) so I just wanted to have a casual laid back atmosphere. The tea house is really small and cozy, with mismatched chairs and tables. The owner is a super nice lady who bakes pastries in the back and prepares everyone's tea in the front kitchen. Iris and I both had the "Old Friends' tea" set, which came with a large pot of earl grey and cucumber sandwiches, and a full plate of cookies, cakes, scones, and fruits. 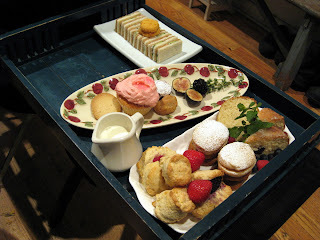 The scones are sooooo good -- the best ones I've had since I had high tea at the Park Lane Hotel in London last summer. They are accompanied by whipped cream (I think...it's definitely not as thick as clotted cream, but seems a bit fuller than my own whipped heavy cream...maybe double cream??) and apricot jam and strawberry jam. The strawberry jam is HEAVENLY!! We are definitely returning here soon. The place also does not accept gratuities, so that suits me, a cheapster, very well! P.S. What a coincidence that the NY Times wrote about Podunk (along with Cha-An, Tea Box, and Cendrillon) the day after we visited it.